Things are coming together for my private HIM, though I still need to clean the transition area. The shirts arrived last week and look ok. The line between the black ink and white shirt seems a little fuzzy, hopefully that is just loose material that will fall away after the first washing. I'm ready to do this race and start the off season. Starting the taper. Today's brick was a little rough. I had aches and pains on all three sports including two where I said, "that has never hurt before" which got me thinking that I've said that more in the last two years than I have my whole life. I suspect many endurance athletes experience the same thing, specially when they reach middle age. Good weekend of s/b/r/c (swim/bike/run/cook). My parents and MIL visited this weekend. It's always nice to have them visit and gives me an extra excuse to cook. 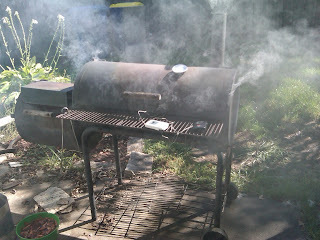 It ended up being a triple cookout weekend including firing up the smoker. 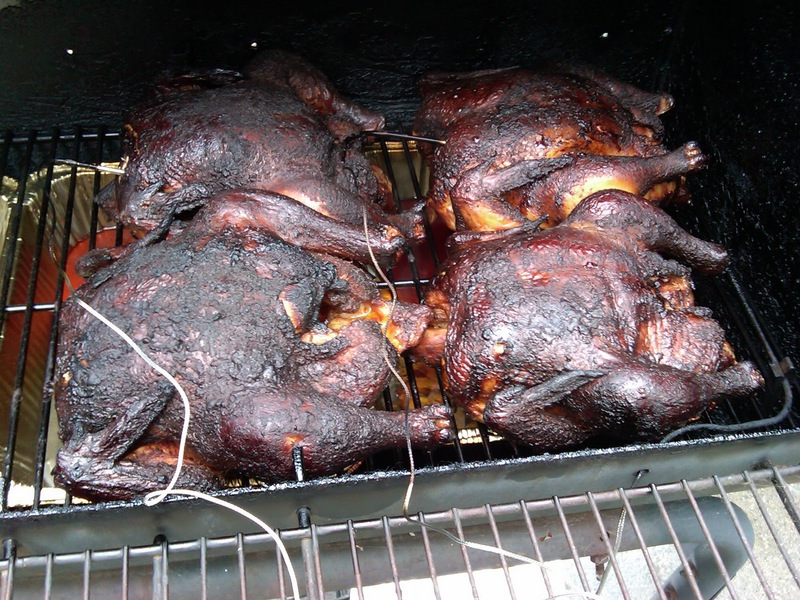 I don't smoke meat often because it is an event between the prep, and the length of time it takes to smoke meat, but the outcome is usually fantastic. Cheryl told me I was smoking chicken to have pulled chicken, so four chickens were the first batch of meat smoked. 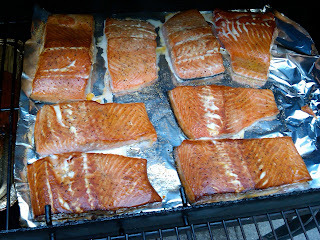 Then I smoked six pounds of salmon (2/3's of that was for neighbor's). As long as I have the smoker going, we might as well fill it up. Makes me hungry just looking at it! Now that looks like post race food I would drool for!! This is so awesome. It was today, right?